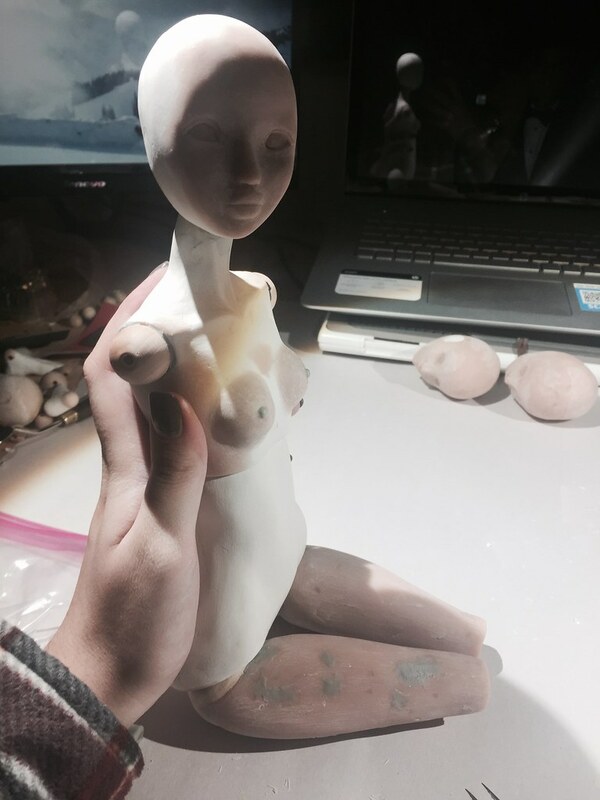 I took a long break from working on my doll, but have rekindled my inspiration for her recently. Tonight, I worked 6 hours on every body piece except the head, which has been at its current stage for quite a while. I still have a lot of work to do, and I have nooo idea how I'm going to create matching limbs, and I think my torso may be too long and need a shave down (or legs are too short?)... but I'm happy with where its going so far. I think the legs need to be longer? Today I spent the majority of the day resculpting the lower torso, which was an older piece that is months old and it was not holding up to my vision (and it had a fatal flaw, the ball joints were ill fitting, and I decided to go a size up). I think she is more on track with what I am imagining now. I also lengthened the legs, but I don't have a picture of that yet! Yes, like this lower torso better!! Love the curves! The overall shapelooks pretty fine so far even though the balls used for the shoulders seem a bit far from the torso...you might want to narrow the shoulder line. Do you use an anatomy book as reference? It really helps. I am torn between thinking the same thing Fawkes, but also liking the shape so far achieved. I know from experience though that it has a long way to go before being "final" though. I anticipate editing the shape quite a bit more. As for anatomy, I do not have books but I go online for anything I need. 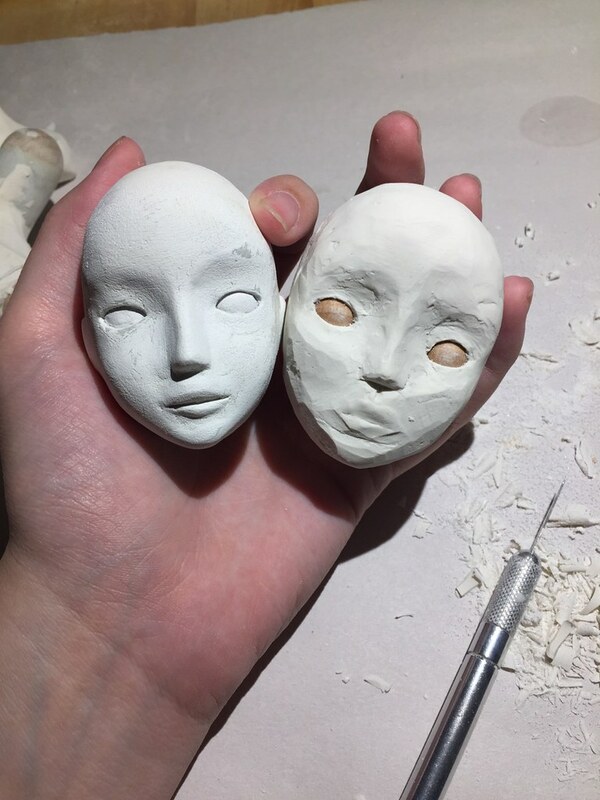 Sculpting a second head! I don't intend to discard the first, but I like the idea of having more than one head to work with in the future, and I enjoy trying to make different features on the faces. It's still quite rough, as is the rest of my work currently. On that note I am torn, I don't know how much to share or what to keep to myself and reveal later. Recently things have started to "click" and I am really understanding sculpting a lot more. 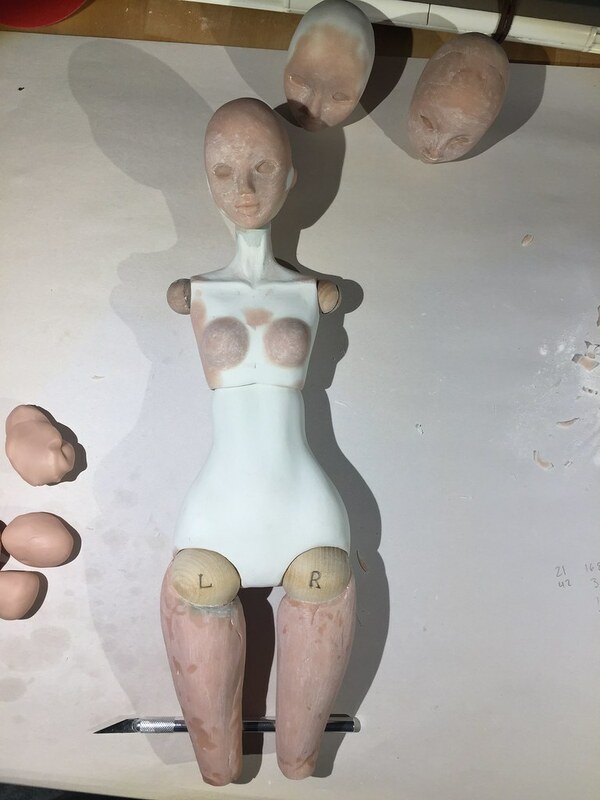 I'm making bigger strides with my doll and am really getting to the point where I can see mold making in the near future! 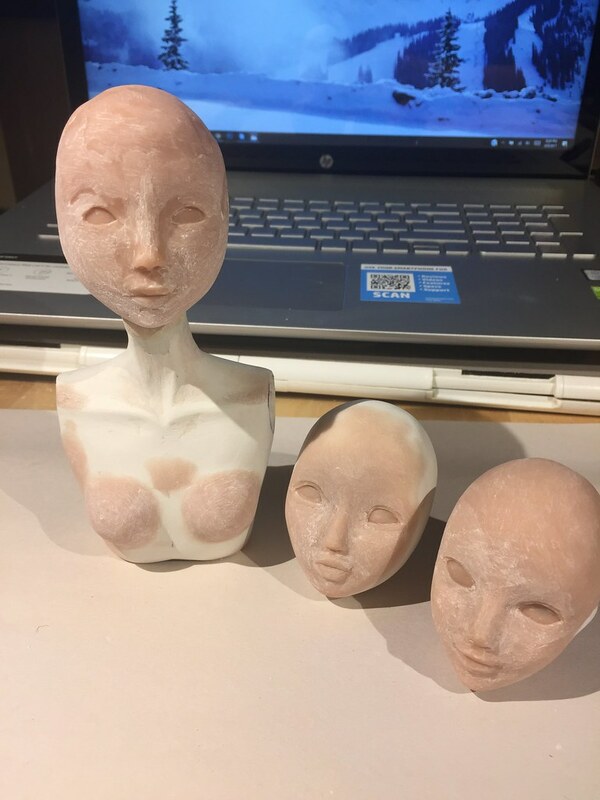 I ran out of white clay so I've been using flesh tone, which is a bit mis matched! But okay for now And I'm finally starting to get my heads to an aesthetic point which I am happy with. Still at it. Doesn't look like much of a change, but even the little stuff seems to take hours and hours. Her thighs are getting closer to even now. I may try to edit the hip joint some to accomodate more of a bend. I am becoming increasingly frustrated with the sculpey clay. 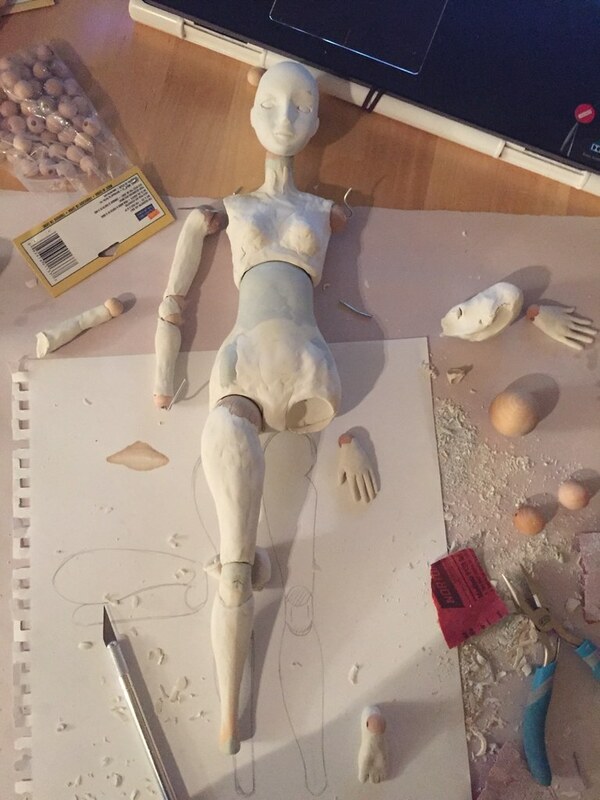 I go through the process of sculpting, baking, adding, baking, etc. and the sculpey gets to a point where it cracks in the oven after it gets to a certain age/hardness. I need to find a new material to work in for my prototype. I have exhausted the abilities of this material and what I have is crumbling before my eyes and ruining my work and progress. Looking good so far! 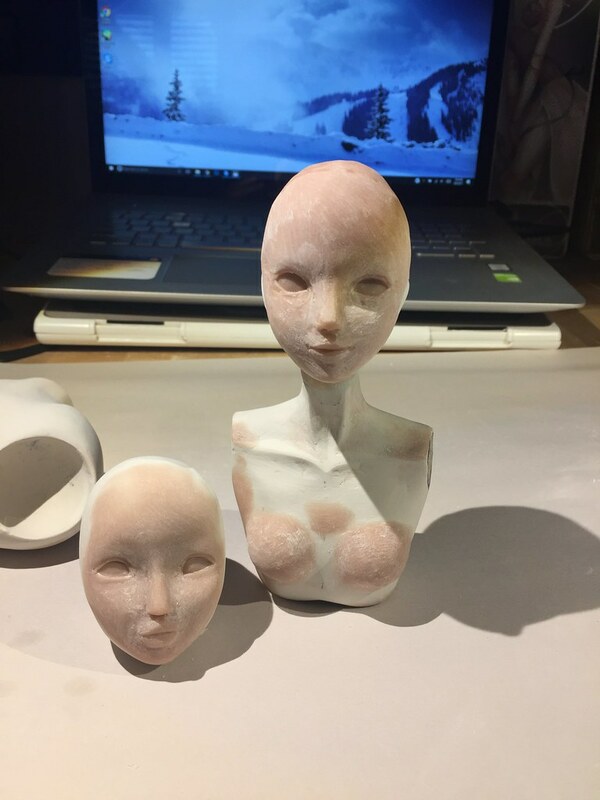 What I did when I reached the end of my rope with sculpey is I made resin parts from it and refined those, and then made more molds from the new parts and refined those. I must have made 7 or 8 sets of molds just refining them at every step. I never actually got the doll 100% finished. I probably need to make another set of molds and refine those! That is not a bad idea, Nenethomas! I was thinking of doing the same, but with Flumo slip airdry clay. I was hoping if I used Flumo, I could make SOME edits with bakable sculpey, because I have pounds of it which I would like not to go to waste. Flumo shrinks, so be careful that your doll isn't suddenly the wrong size. Also, you don't have to bake the sculpey to use it with resin parts. 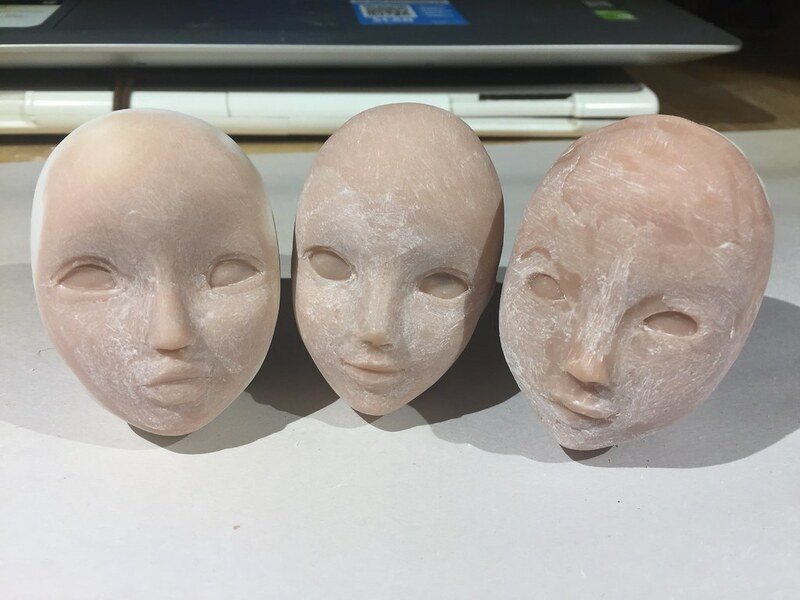 You can roughly sculpt the changes you want, make a slush silicone mold, and then sand and refine the new resin part. 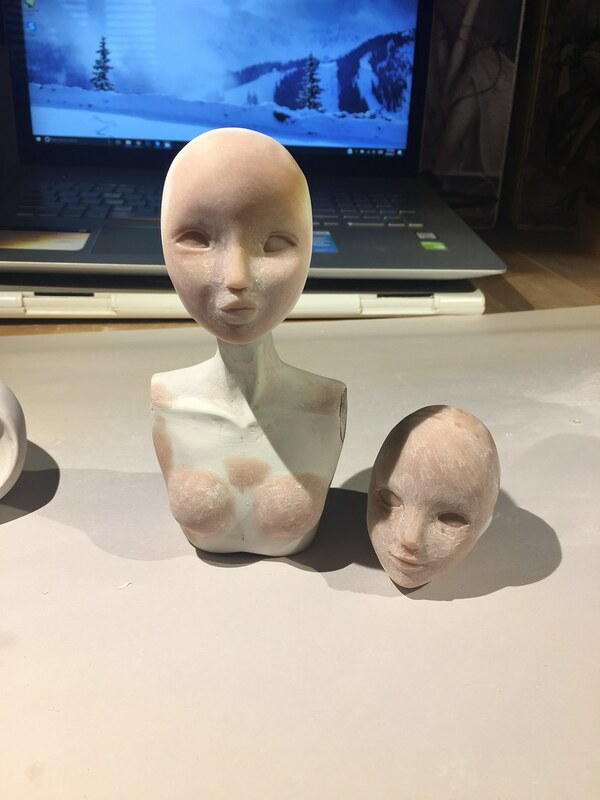 Or if you look at Marina's sculpt for her Rubenesque doll here the sculpy sculpt is very, very rough, and from that she made a set of plaster molds. You can still see bits of plaster in the nooks and crannys of the sculpt. 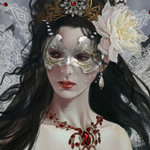 I believe she refined the porcelain parts, and most likely made a set or even two of the downsized parts. 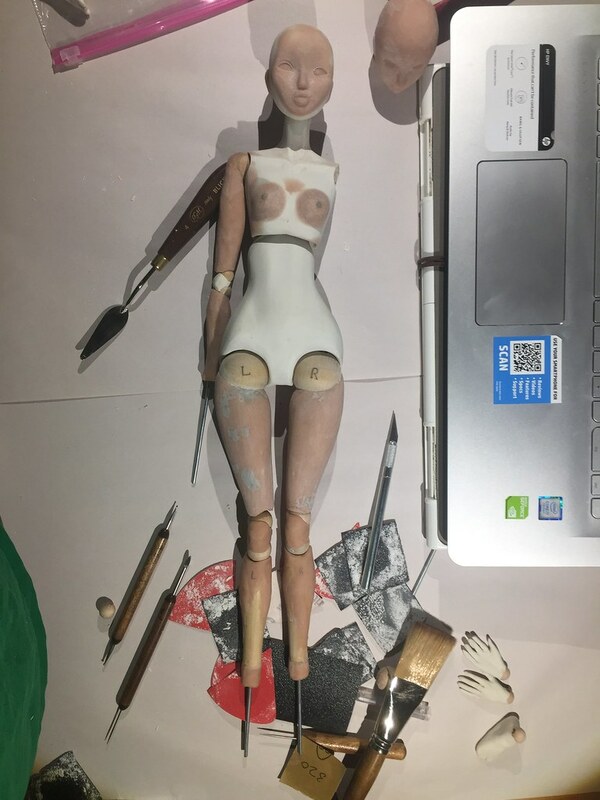 Based on the size of the hemostat holding the strings in, the rough doll is very large, much larger than the diminutive regular EDs. 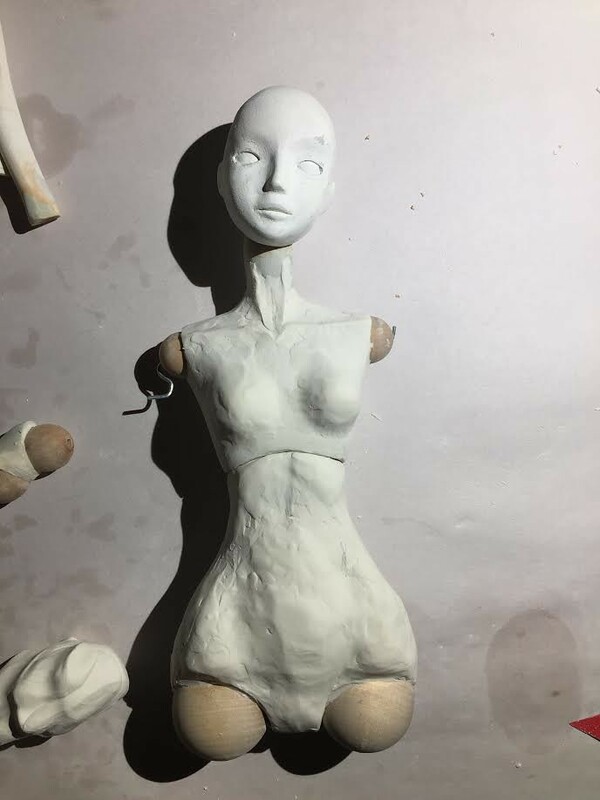 In a book I have called 'Mold Making for the Original Doll-the Blufrogg method' his doll sculpts are made out of a soft unfired clay. As for sculpey going to waste, don't worry about it. You can always find uses for sculpey!